Ozzie Albies' contract extension comes just over a week after his friend Ronald Acuña Jr. inked an eight-year, $100 million deal. 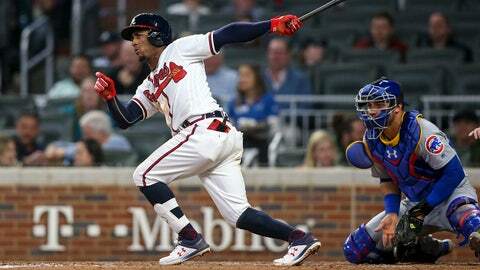 ATLANTA — For the second time in a week, the Atlanta Braves locked up a young piece of its core, this time assuring Ozzie Albies could be in place for up to nine years. The deal, which includes two option years, could be worth up to $45 million, keeping the Curacao native in a Braves uniform through the 2028 season. Albies’ contract comes a little more than a week after the team handed the player he calls his “brother,” Ronald Acuña Jr. an eight-year $100 million deal (which, with two option years could reach 10 years and $124 million). While the verdict is still out on who Albies is at the plate, there’s reason to believe this contract could turn into an unequivocal steal. Hitting .364/.429/.500 through 11 games this year with three doubles and a pair of RBI, Albies put together a 2018 season with extreme splits. Earning his first All-Star nod after slashing .281/.318/.516 — punctuated by a 158 wRC+ in April — he would go on to hit 33 percent below league average in the second half. He went from 20 home runs to four, and hit .200 in the postseason, and on the year, the switch-hitter had an 84 wRC+ vs. righties to go with a 141 against right-handed pitching. Despite that second-half slide, Albies was still a 3.8 fWAR player with a 1.2 defensive WAR (11th among second basemen) with 14 steals. To put his new deal into context, Albies’ $5 million average annual value is 16th among current second base contracts, just ahead of the Orioles’ Jonathan Villar ($4.825 million and a 2.0 fWAR last year), and behind the Cardinals’ Kolten Wong ($5.1 million with a 2.8 fWAR). The overall value of the deal is eighth at the position and $14.5 million less than the Rangers signed Rougned Odor, who has never had an fWAR higher than Albies in any of his six MLB seasons. Anthopoulos said in order to come up with the parameters of the deal, they looked at recent contracts signed in the second-base market, with the likes of the Diamondbacks’ Eduardo Escobar (three years at $21 million), the Nationals’ Brian Dozier ($9 million for one year), the Brewers’ Mike Moustakas ($10 for one season with an option), the Mets’ Jed Lowrie (two years at $20 million) and the Twins’ Jonathan Schoop ($7.5 million for one season). But the difference between all of those players is all of them are are at least 30, while Albies is just 22. If Albies finds a consistent approach akin to his first half of last season — and in a small sample size he’s hitting righties (.344/.432/.438) well, while still hammering left-handed arms (.417/.417/.667) — the Braves will have a star at a bargain. If he’s somewhat in the middle of last year’s stellar first half and second-half woes at the plate, he remains an elite defender with power potential. Regardless, this is financial reality of the future Anthopoulos and Co. have painted with the deals for Albies and Acuña: the can have a combined 19 years at $169 million. That’s just a little over half of what the division rivals Phillies spent for 13 years of Bryce Harper.